No sports wish remains unfulfilled during your family holiday in the Allgäu. The location in the heart of nature makes is possible. With us there is plenty of room and 1.001 possibilities right outside our hotel doors. Mountain biking, geo-caching, hiking or Nordic-walking on the Ofterschwanger Horn and the Gunzesried valley are just a few of them to start with. Here you find traffic-free alpine paths and challenging trails. We regularly offer guided walks to explore and collect herbs. Nordic-walking sticks, prams, back carriers for your tour through the nature reserve can be borrowed free of charge. The family hotel in Bavaria is perfect for sports fans: tiring soccer, basketball or tennis games await you on own sports fields. And archery guarantees action and excitement. In and around our creativity room – an old alpine hut converted into a real workshop – tinkerers and handymen come into their own within the scope of our entertainment programme. Around the Allgäuer Berghof you can do something good for your body and enjoy the beautiful Allgäu at the same time. On hot summer days plenty of possibilities to cool down are offered. Mum and dad relax on the deckchairs under the shade sail while the kids search for tadpoles and frogs in Froschis water park or go out “boating” with the raft on the „large pond“. Dam builders and sand castle architects prove their skills on the water playground. Here there can be pumped, played with and sand and messed around with mud to the heart’s content. Attention mum and dad: you may be sprayed as well! Enjoy your kids beaming with joy while they are playing together with countless playfellows. On the Bobbycar race track it goes fast and hot when the little ones race for victory. Via Froschis slide tower you reach the sandbox in which you can play to your heart’s content. The play road with several play stations invites you to make a walk round the hotel. The older children give their imagination free rein and play cowboys and Indians in the Indian camp. In the evening it’s time to bake baguettes at the campfire together and so many exciting Indian stories are being told. On the pirate boat big and small sailors rush into the big adventure and in the slackline park balance and dexterity are proved. Relax together in the family hotel in the Allgäu. In our family-friendly hotel-spa warm showers and paddling pools are waiting for you. There are croacking showers and comfortable lounge beds as well. In your family hotel in Bavaria there are plenty of possibilities to play, have fun and explore. With us the kids don't need to go anywhere to have fun and experience the perfect children's holiday in Germany. Whether rabbit, ponies or sweet cows; during your family holiday in the Allgäu there are many quadrupeds waiting to be petted. Your kids can also ride on our ponies and Haflingers. In the Allgäuer Berghof you don't need to compromise if it comes to action during your family holiday in the Allgäu. From diving in the Berghof-pool to rafting on wild rivers we offer everthing that makes a sporter's heart beat faster. 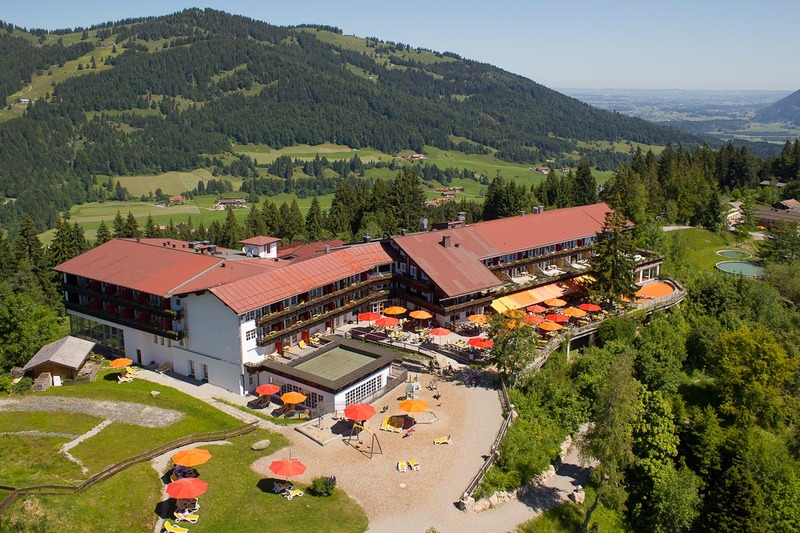 Our children's hotel in Bavaria is located amid the beautiful Hörnerkette nature reserve. Use the numerous hiking trails and enjoy the splendid view of the valley, while climbing to the mountaintop with the entire family. The perfect family holiday in the Allgäu: experience the Allgäu from its most beautiful side. Explore castels, treasures f nature, Allgäu metroples or leisure areas. Many attractions are not far from the Allgäuer Berghof. Your kids can learn a lot in our family hotel in the Allgäu: for example swimming, diving, skiing or horseback riding. From qualified instructors. The courses offered in the Berghof leave nothing to be desired. Of course our child-friendly hotel has a children's restaurant as well. In the culinary field the kids will lack nothing. Enjoying the meals together with the other kids or from the baby buffet makes all kids happy.